These eco-friendly bottles are made from high quality, 18/8, food-grade stainless steel; totally free of BPA and other toxins. Because stainless steel itself is safe, the coat the inside of the bottle doesn't need a plastic or epoxy lining, one of the main differences from aluminum bottles. Whether you’re heading out for a short hike or giving that big presentation at work, the 18oz Kanteen holds enough to keep you hydrated, but is also fits easily into your bag, pack or briefcase. Now available with the Sport Cap 3.0; featuring a soft silicone spout, 25% higher flow rate and "chirp" free hydration. 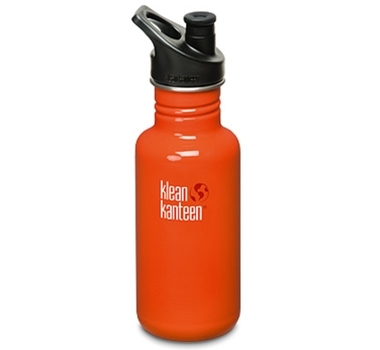 Like every Klean Kanteen, the 18 oz bottle is made of 100% recyclable, high-quality, food-grade, stainless steel so it doesn't need a special lining like some other metal bottles. It's completely BPA-free and won't leach toxins or funky flavors into your water, juice, smoothie, or drink of choice. Plus it weighs only 8 oz when empty and is incredibly durable, so you can reuse it for years. The large-mouth design allows you to pour in big stuff like ice cubes, and makes cleaning up your Klean Kanteen as simple as washing it with mild soap and warm water or throwing it in the dishwasher. Yet the slim design fits into just about any cup holder or Kanteen® bike cage. Day after day, year after year, your Klean Kanteen will keep your drinks fresh, crisp and clean tasting.